Grab the grenade launcher and deal with evil occupants that came to take control of your planet. There is still a chance to keep it for yourself. The aliens made a big mistake when they have chosen the Earth as their next target. Probably they thought that it will be easy to conquer us, yet they were so wrong. Despite the fact that they possess more powerful and modern weapons, still they are mortal and can be killed. Grab your grenade launcher and show them their place. 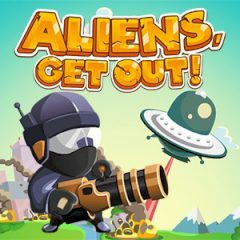 Games Similar Aliens, Get out!